Some of my favorite pastimes are drinking wine, watching baseball, hitting the slopes and cycling. I’ve seen this bottle many times at wine shops and have been drawn to the label – and name! Sniff…. deep raspberry and blueberry dominate, with some licorice and pepper too. Dark, chewy fruit on the midpalate. Lots of acidity on the mouthfeel that lingers on the finish. 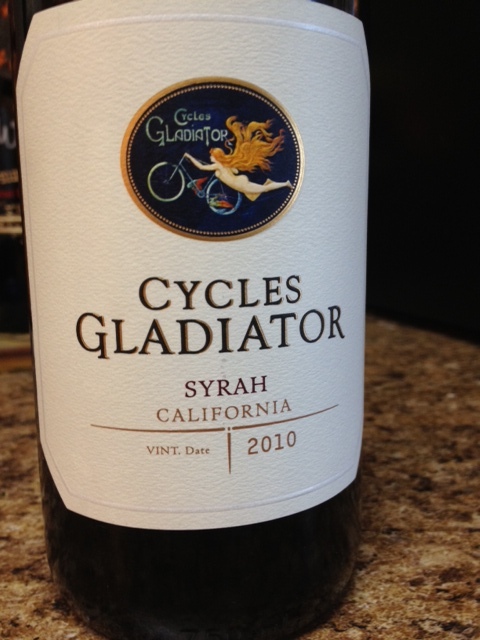 This syrah is not easy to sip. For some reason, I felt I could taste the alcohol in it and was surprised to see that the alcohol content was 13.5%. Time to take out the wedge of cheddar! Dark chocolate (Truffle Gateau* Dark Chocolate Coconut) – believe it or not, this wine’s bite overpowers the chocolate! Dark chocolate #2 (Truffle Gateau Dark Chocolate Expresso) – WIN. Absolutely loving this combo… this expresso-laced chocolate brings out mocha notes in the wine and balances it out.